Gladys J. King, 89, of Sheboygan, WI, formerly of Port Washington, WI died August 2, 2011 at Aurora Medical Center in Grafton, WI. She was born April 18, 1922 in Cleghorn, WI to Frank and Juliane Brantner Weiss. She was one of 11 children growing up on a farm south of Eau Claire. She married Leonard A. King of Pleasant Valley, WI on June 9, 1942 at St. Patrick’s Church in Eau Claire, WI. After their marriage they moved to Port Washington in 1942 when her husband began working for Wisconsin Electric at the Port Washington Power Plant. Her husband Leonard preceded her in death September 28, 1990. Gladys was a wonderful homemaker and mother. She was an excellent seamstress and loved to do fine crochet with cotton thread. She instilled a love of playing games in her children and grandchildren, especially cribbage. She never let you win unless you earned it. For many year she and Leonard had a large garden from which she canned a lot of things. She also loved the days spent fishing on Lake Ojaski near Chetek where they had a cottage for many years. She was an active part of all of her grandchildren’s and great grandchildren’s lives, remembering them all to the end. 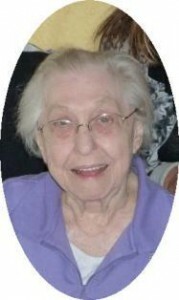 An avid sports fan, she kept up on all the local teams and was a big fan of the Packers and Brewers. She is survived by her daughters Janet (Fred) Krier of Belgium, WI and Mary (Tom) Gabrich of Sheboygan, WI. Further survived by 10 grandchildren, 21 great grandchildren, daughter-in-law Charlene King of Port Washington, WI, other relatives and friends. Preceded by her husband and son Steven King. Rev. Thomas Lijewski will officiate funeral services 6 pm Friday August 5, 2011 at the Poole Funeral Home, 203 N Wisconsin St., Port Washington, WI . Interment St. Mary’s Cemetery, Port Washington. Visitation 4 – 6 pm Friday at the funeral Home. The family has suggested memorials to Juvenile Diabetes Research Foundation International, 3333 North Mayfair Road, Suite 107, Wauwatosa, WI 53222.